The question of what is to be done when air comes out of the oil fill cap is one that has been asked dozens of times on this website. Does your air compressor have this problem? If so, you’ve come to the page with the answer as to why air comes out of the oil fill cap, and what you can do about it! Not every air compressor is oil lubed, so not every air compressor can develop air coming out of the oil fill cap, though the source of the problem can occur on any reciprocating air compressor, lubed or not. How is air getting out of the oil fill cap? Every oil fill cap will have, or should have, a small vent hole. Some are in the top of the cap, some on the side. Inside the cap it is common to have a small foam insert that will allow air through, but normally not oil. It is through this oil fill vent hole – depicted in the sketch – that compressed air can escape. Air path to vent the air in the compressor oil sump of some models of compressors. Air Comes Out Of The Oil Fill Cap – Why? Where is the air coming from? As the compressor piston cycles seals on the outside of the piston press against the wall of the cylinder. The seals provide two functions. One is to keep the oil that is in the compressor oil sump, and splashing up onto the cylinder and piston components lubricating them, below the seals and out of the compressed air. The other purpose is to keep the air that is being compressed by the cycling piston from getting into the sump and… as you might expect it to do, escape by flowing out the oil fill tube and vented cap to atmosphere. Since these seals cannot be so tight to encumber the operation of the compressor pump – in other words they will leak a bit – there will always be a small amount of air that gets by those seals. It is happening all the time the piston is cycling, and typically is in negligible amounts. Sump oil will, too, wick by the piston seals and there will always be a little compressor sump oil getting by and into the air that is compressed into the tank. Draining the tank regularly will help keep this oil from migrating into the air stream to air tools and equipment. Typically, compressor lubricating oil does not work well with seals, so keeping the lube oil out of the air stream is important. The oil sump is vented all the time, and the small amount of air that gets into the sump is gone before the compressor owner can notice it… unless! Unless the piston seal wear is excessive. Then, as the compressor pump works, lots of air, instead of being driven down into the tank, flows by the piston seal and into the sump. That air, too, will escape up the oil fill tube, but now is such quantities that it can be felt if a hand is held over the oil fill cap. In fact, in compressors with major seal wear, the amount of air getting into the sump can blow the oil fill cap right out of the tube, particularly if, over the years, the vent hole has become smaller or plugged. 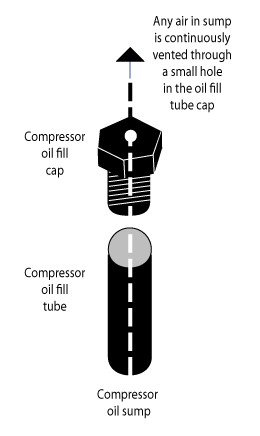 Can you disregard the air coming out of the oil fill tube if the cap stays on? Sure. It depends on the amount of air escaping. Ignoring the leak will mean that your air compressor will have to run longer to fill the tank to cut out. Ignoring the leaking air will mean that, even as the air is bypassing the piston seal into the sump, compressor oil is, too, getting from the sump into the air going into the tank with the repercussions noted earlier. You will have to monitor the oil level carefully as well, to ensure that low oil doesn’t cause a compressor overheat. The bottom line is that eventually you will have to replace the piston seal to correct this problem. That will lead to issues of finding parts, as many of the low cost, big box store type compressors, have no parts suppliers at all. Still, you can often find piston seals that are not Original Equipment Manufactured, but are available from industrial seal suppliers. If you Google “air compressor piston seal” as I just did, you will find a host of suppliers. It will be necessary to tear down the pump and remove the piston to get at the seals. Remove what is left of them and measure the actual size of the seal and it’s O.D. This will help you narrow down suppliers of a piston seal that will fit your compressor piston. When the pump is disassembled, make sure that the inside of the cylinder is inspected. A badly worn piston seal may have allowed the metal of the piston to come into contact with the cylinder wall, and the result may be a scored cylinder. That being the case, replacing just the piston seal may not be enough. It may be necessary to replace the cylinder sleeve too. A little bit of air coming out of the oil fill vent cap is normal. A lot indicates a pretty serious problem with the pump, and it should be corrected sooner rather than later.